From the set to the must-see dress of the season, see all the pictures from the Erdem AW16 fashion show. 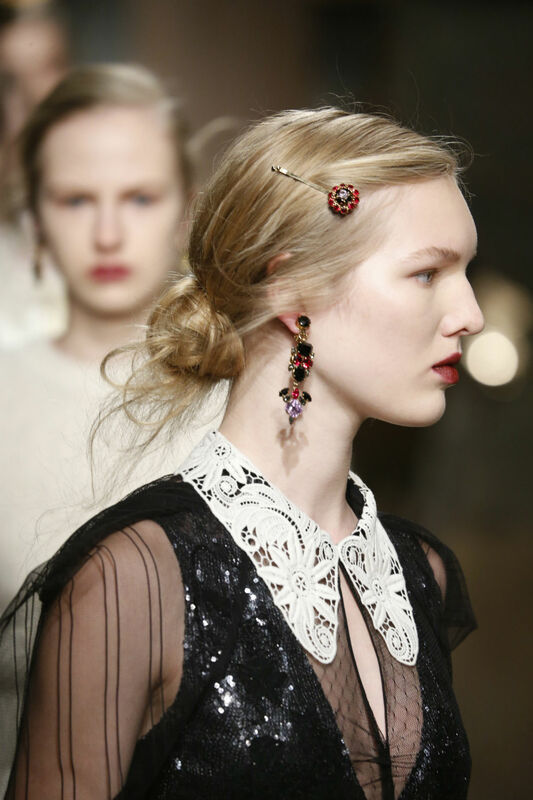 Is there ever a season that we don’t fall helplessly in love with Erdem’s new collection? The short answer is a resounding no and the AW16 season is no different. Leaving behind SS16’s train set, the audience stepped into a set designed by Robin Brown featuring an antiques shops worth of beautiful chandeliers, sandstone urns, Roman-esque pillar, wicker love seats and theatre-esque curtains hanging in the Old Selfridges Hotel. Yes, there was even a life size polar bear hidden under a dust sheet in there. Transport yourself there by imagining the remnants of a grand manor house, left to gather dust for a few years. Loyal fan to the brand, Alexa Chung was of course perched on the FROW next to good friend and fellow regular Daisy Lowe who commented on her Instagram that her mother, Peal would be well suited to the collection. Save from a couple of Chanel-esque houndstooth suits, Erdem stuck to what he is known for and produced a collection full of beautiful floral gowns with an added air of faded glamour for the AW16 season. Think vintage velvets, frilled bibs and doily-collared midi to floor length gowns. Shoes varied from metallic block heeled flats to clashing patterned boots which were worn with midi-length dresses and a delightfully comfy looking pair of mules, while models wore grey leather globves that snaked half way up their arms. Described as ‘pure magic’ by Instagram’s Eva Chen, we’ve just got to agree. 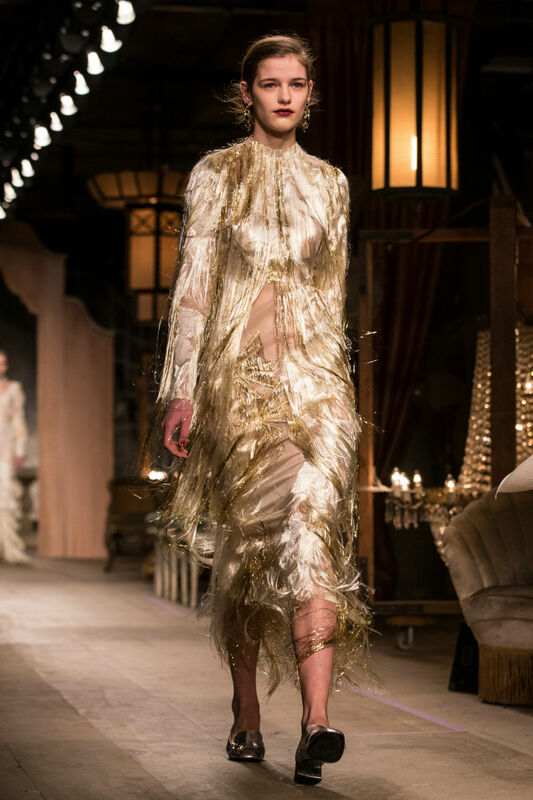 The dress that has got everyone talking was a flurry of gold fringing that swished it’s way down the catwalk. It’s official: We. Are. In. Love. We’ll be remortgaging our houses for this one come the AW16 season. If you don’t think even that will afford you the gown of the hour, then no worries, there’s a silver sequin fishtail skirt number that will tide you over. Anthony Turner from cult brand Bumble and Bumble worked his magic on the hair backstage at Erdem, keeping the look simple with a messy bun and clipping back fringers and stray away hairs with embellished pins, while NARS’ Val Garland worked on the ‘Black Dalia’ makeup, with brushed up brows, glowing but pale skin and a deep red lip. Low maintenance? We likey! The soundtrack was as atmospheric as they get, with the music coming from the 12-Academy award nominated film, All About Eve, while voiceovers from Hitchcock’s 1940s thriller, Rebecca were thrown in there for good measure. It will come to no surprise then, that Erdem cited Mrs Danvas from Rebecca as a reference for the collection.